The TropAg Program convened a symposium in May 2011 to gather corporations, foundations, and financial institutions to share lessons and challenges on how to upgrade Africa’s agricultural value chains. The symposium provided a unique opportunity for organizations – including the Alliance for a Green Revolution in Africa (AGRA), BASF, the Bill and Melinda Gates Foundation, DuPont/Pioneer, Ericsson, KPMG, Mosaic, Monsanto, PepsiCo, the Syngenta Foundation, Soros Economic Development Fund, Sumitomo, Unilever, and Walmart – to discuss their experiences working with smallholder farmers in Africa, as well as other developing countries. 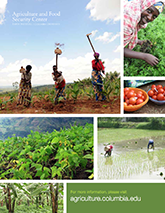 The intention is to create a knowledge network of organizations to collaborate on upgrading African agriculture to address food security and support the transition to commercial farming to break the poverty traps seen across the continent.